South of the coastal redwood forests of Prairie Creek Redwoods State Park, the tall trees move inland a few miles and the cliffs bordering the Pacific are interrupted by four lagoons, each separated from the ocean by a thin strip of sand and pebbles. Named Big, Dry, Stone and Freshwater, the wetlands extend for 8 miles before the coast resumes its more familiar rocky appearance, viewable at such nearby places as Patricks Point State Park and Trinidad State Beach. 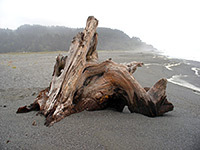 Stone Lagoon, Dry Lagoon and the sand bar of Big Lagoon are protected as the Humboldt Lagoons State Park, for which entry is free and facilities are limited, but the land is peaceful and scenic, albeit often shrouded in fog and low cloud. Activities include picnicking, fishing, hiking along the beach, wildlife watching, boating and camping, in a small, developed campground on the north shore of Stone Lagoon. 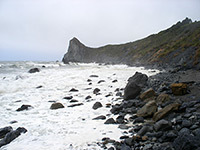 US 101 is routed inland along the east side of three of the lagoons but crosses the sand bar of Freshwater Lagoon, while a short spur road reaches the ocean at Dry Lagoon; these are the last easily-reached beach access points until False Klamath Cove, 30 miles further north. Although located at the southern end of Redwood National Park rather than within the state park, the beach bordering Freshwater Lagoon is easiest to reach, so can often become quite busy. The sands are wide and gently sloping, lacking any rocks apart from at the south end where black cliffs (the Freshwater Rocks) rise up at the edge of a range of coastal bluffs, making it impossible to walk any further south along the beach. 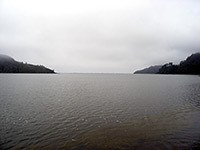 The lagoon is quite small, enclosed on three sides by thick forest, and viewable from the east by a narrow, winding road (Old State Highway), along which are a few laybys suitable for free camping. Half a mile south, Stone Lagoon is larger and has a rockier shoreline, but is surrounded by the same steep-sided, spruce and moss-clad hills. At the edge of the forest overlooking a hidden cove, the Stone Lagoon Boat-in Campground offers six primitive sites, open only to canoeists or kayakers. The park headquarters, a museum and bookstore are located adjacent to the lagoon beside US 101, occupying an old building once used as a restaurant and motel. Just south is the short side road for the parking area next to Dry Lagoon, now a small marshy enclosure filled with reeds and long grass, since the original water was drained by local farmers in the 1900s. 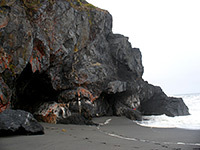 The nearby beach is wide and sandy, pounded by fierce waves and sprinkled with large pieces of driftwood; it extends only a short distance north, as far as another impassable rocky promontory (Sharp Point), but for 4 miles south, all the way along the edge of Big Lagoon. This lagoon is part of a separate preserve, the Harry A Merlo State Recreation Area, and has a visitor center/campsite at the far end.